MELTED RIOT begins as a breathing landscape made of people. Inspired by the Stonewall Riots of 1969, this interdisciplinary performance gives way to somatic revolt, political satire and dances about space stations. 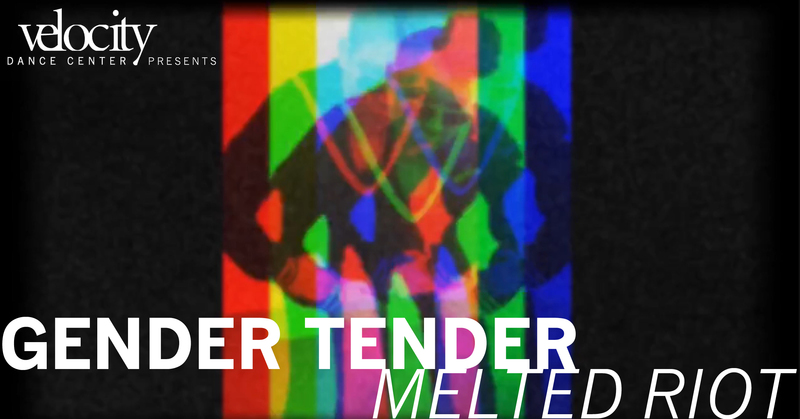 MELTED RIOT is a surreal protest song, a queer meditation, a psychedelic research project, a punk prayer. Featuring Fox and over 20 other Seattle area artists. MELTED RIOT happens on the 50th anniversary of the Stonewall Riots in NYC, a defining moment in the movement for equal rights for the LGBTQ+ community and the original Pride weekend. Based on a vision transgender artist Fox Whitney had of drag artist and cabaret singer Stormé DeLarverie throwing the first punch at the Stonewall Riots on June 28th, 1969, MELTED RIOT will transform the space of Velocity Dance Center using Fox’s binary-disintegrating choreographic techniques and interests in altered states, shock comedy and the metaphysical world. The structure of the performance is created using information Fox received while dancing to the songs that played on the Stonewall Inn jukebox during the riots in 1969. In line with this research, MELTED RIOT uses tactics rooted in dance, durational performance and visual art to investigate the effects peaceful and violent forms of support and sabotage have on the bodies, minds and spirits of the queer community. Performance artists that were present at the Stonewall Riots like Marsha P Johnson, Stormé Delarverie and Sylvia Rivera inspired this project as well as artists like Yvonne Rainer, Faith Ringgold, Agnes Martin, Nan Goldin, Andy Warhol, Richard Pryor, Simone Forti, Felix Gonzalez-Torres, Pauline Oliveros and the history of tableau vivant in performance (the act of recreating paintings as living artworks). Beyond the two performances Whitney is premiering, MELTED RIOT promises to incorporate public spaces into the work with a series of public and outdoor events that will occur around the performance, both as part of Capitol Hill Arts Walk and on the day of Trans Pride. From outdoor screenings of Whitney’s research films to processionals in neighboring Cal Anderson Park and a post-show party in conjunction with Trans Pride, this series of events spills out of the black box walls to hold spaces around Capitol Hill dedicated to both the real and imagined people that took part in the Stonewall Riots of 1969. Through these events and the performances themselves, MELTED RIOT softens the word riot (a violent disturbance of the peace by a crowd) replacing the word VIOLENT with: somatic, satirical, surreal, psychedelic. The project will use a crowd of voices, bodies and sculptural interventions to investigate radical extremes. MELTED RIOT welcomes whispers and screams, subtle gestures and displays of athleticism, LSD solo trips and hippy commune collectivity. FOX WHITNEY is a transgender artist creating performative experiences that combine theater, dance and visual art. Fox’s queer multiracial non-binary point of view is at the heart of their performance project, Gender Tender, for which Fox creates experiences that investigate the nature of queer and transgender personal relationships and histories as well as the surreal nature of transformation, trauma, and healing. Gender Tender engages a team of artists trained in Fox’s unique methods modeled on the structures of sports teams, sitcoms and riots. Technical and conceptual focus combine to engage performers and audience in the dance of intellect, embodiment and radical compassion. Their work aims to disintegrate binary thinking for all participants. Fox Whitney was awarded the 2018 Artist in Residence position at Velocity Dance Center. Their performance work has been commissioned and produced by On the Board’s NW New Works Festival and Solo Festival; Velocity’s Next Fest NW and Seattle Festival of Dance Improvisation; the Seattle International Dance Festival; Yellow Fish Epic Durational Performance Festival and was selected for the inaugural season of Seattle’s Gay CIty Arts. Their performance work has also been presented in Minneapolis/St. Paul, Portland OR, Chicago and San Francisco. They have had their short films screened as part of the INFRARED series curated by Malic Amalya at CounterPulse in San Francisco celebrating the opening of Compton’s Transgender Cultural District in 2018. Their dance films have screened at Seattle’s Twist Film Festival, Translations: Seattle’s Transgender Film Festival and at Next Dance Cinema presented by Velocity and Northwest Film Forum. They have an MFA in Fiber and Material Studies from the School of the Art Institute of Chicago and have exhibited their visual art nationally including shows at SAIC, Columbia College, Heaven Gallery, Roxaboxen Gallery (Chicago), at CalTrans Pride and Femina Potens Gallery (San Francisco), and at Gay City Arts and the Shunpike Storefronts Gallery (Seattle). Fox is also a composer and has studied piano, violin and voice. They continue to create their own songs and sound scores that have featured prominently in their choreographic work. Their current project MELTED RIOT, a queer meditation inspired by the Stonewall Riots of 1969, is supported by Velocity Dance Center’s Artist in Residence program. Fox is a dancer and choreographer with a focus on improvisational, somatic and contemporary choreographic methods. They are a certified yoga teacher (graduate of the 300 hour program at the Yoga Center of Minneapolis, RYT 200 Yoga Alliance) They have performed in the work of keyon gaskin, Maureen Whiting Dance Co., Vanessa DeWolf, Aniccha Arts, Malic Amalya, Neil Ferron, Courtney Meaker, Andrew Schneider and Mimi Allin. They’ve trained with yogis Coco Elwood, Desiree Rumbaugh, Kevin Kortan and Faith Hunter. Fox trained as a teenager at the Iowa Shakespeare Conservatory and continues to study acting and incorporate those processes into their work.